Yet at age 19, Rachel Lindsay was diagnosed with bipolar disorder, and then realized that upon graduating, she had to be shackled to a corporate job that would provide steady income and much coveted health benefits. All cartoonist Rachel Lindsay wanted was to live her life as an artist — whether that meant being a cartoonist or a musician really did not matter in the grand scheme of things. This no-win situation is at the heart of Rx, Lindsay’s graphic memoir detailing the conflict between her wants and needs. Ironically, while working at an ad agency, she was assigned the Pfizer account, and had to provide copy and write reports for an anti-depressant medication. She observes her reality with a mixture of cynicism and a dark sense of humor. A two-page spread at the beginning of the book collects a series of clichéd images concerning ads for antidepressants: a woman staring at the table while, behind her, a potted plant has wilted, a woman looking spaced out while children are happily playing outside. Rx is not all about exposing the hypocrisies of the American mental-health industry from a universal perspective, though. At its heart is Lindsay’s own story of a manic episode that results in hospitalization. “You won’t know the shape of your unraveling until it happens,” she reflects in the prologue. 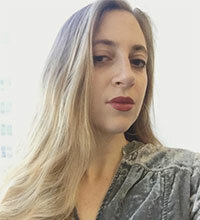 What starts off as corporate-job-related drudgery morphs into a full-blown manic episode, marked by increasingly erratic behavior that, eventually, results in hospitalization, where Lindsay, after letting go of her anger and frustration related to still being sick despite diligently following her treatment plan, eventually realizes that in order to be considered “sane” she has to act that way. “Sanity is a performance,” she cynically ponders before finally being released. Ironically, she started working on what would become Rx during her hospital stay, which meant that it was that period of hospitalization that eventually enabled her to become the artist she wanted to be. Lindsay’s highly stylized and cartoonish style pairs quite well with the genre of her choice, and the way she lays out the pages mirrors her own unraveling: her corporate, hamster-wheel-like life is narrated in neat grids, while, as she progressively succumbs to mania, she takes more artistic freedoms with the layout of the pages. Vignettes become staggered instead of neatly aligned, and a cloud of coils — the depiction of the onset of mania — takes up progressively more and more space on the page, her clinical chart illustrated as a comic contained within a medical clipboard. Clarity and readability, however, are never an issue, as her black-and-white pages, with their airy style that is reminiscent of Charles M. Schulz’s Peanuts cartoons, remain reader-friendly throughout the book. 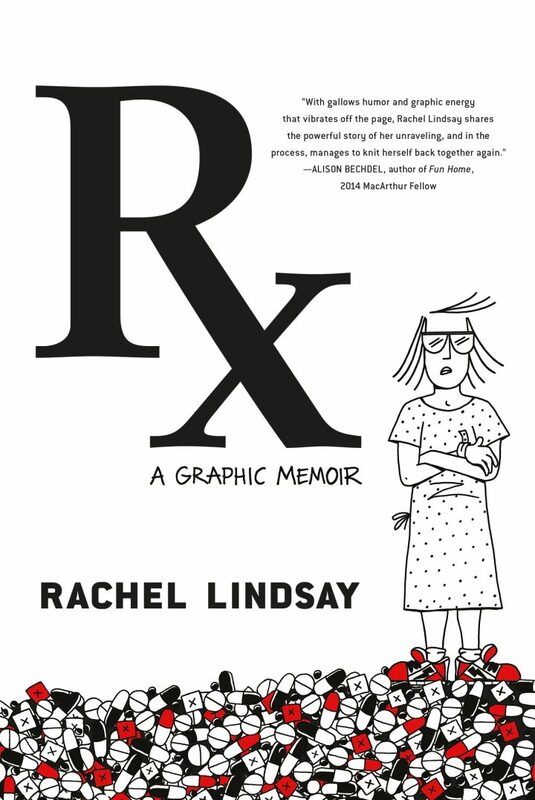 One can’t help but compare Rachel Lindsay’s Rx with the famed and best-selling bipolar graphic memoir Marbles by Seattle-based cartoonist Ellen Forney. Atistically speaking, the two authors have very different styles, with Forney’s being, perhaps, more painterly and neat. Lindsay’s work, however, can better strike a chord with audiences who entered the workforce at the height of the recession. While Forney’s concern, as a successful and established cartoonist, was what it would be like to live as a “medicated artist,” Lindsay’s work emphasizes the financial component and practical aspect that comes both with wanting to pursue an artistic or creative career and living with a condition that requires quite an expensive, ongoing treatment plan. In a way, it’s the graphic counterpart to Esmé Weijun Wang’s The Collected Schizophrenias, a recently published collection of essays centered around the author’s diagnosis of schizoaffective disorder and the day-to-day limitations it posed. In all, Rx is an essential read for those willing to explore the intersection of creativity and mental illness in its most day-to-day and least abstract aspects. Rx (2018), by Rachel Lindsay, is now available from Grand Central Publishing and can be purchased on Amazon and other online retailers.